Strip all the leaflets from the leaf petiole. This can be done directly from the branches if the leaves have not been stripped off the main branch before transportation. At this stage, diseased and damaged leaves are discarded. 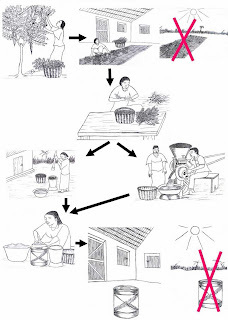 Wash leaflets in troughs using clean potable water to remove dirt. Wash leaves again in 1% saline solution for 3-5 minutes to remove microbes. Finally wash again in clean water. Leaves are now ready for drying. Drain each trough after each wash: fresh leaves must always be washed with fresh water. Strain water from the leaves in buckets that have been perforated, spread leaflets on trays made with food-grade mesh and leave to drain for 15 minutes before taking them to the dryer. 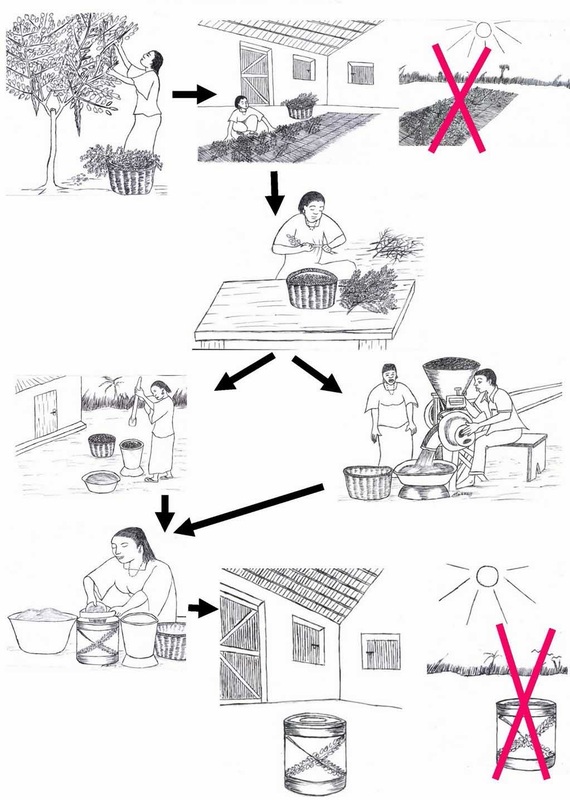 There are three main methods for drying moringa leaves. Spread the leaflets thinly on mesh tied on racks (mosquito net mesh can be used) in a well-ventilated room. This room should be insect, rodent and dust proof. Air circulation can be improved by using ceiling and floor level vents protected with a clean filter to keep the sun and dust out. It is possible to use a fan, but the air must not be directly oriented towards the leaves, as it can increase contamination with germs in the air. It is advisable to turn the leaves over at least once, with sterile gloves, to improve uniform drying. Leaves should be completely dry within a maximum of 4 days. The loading density should not exceed 1 kg/m2. However, room-dried leaves cannot be guaranteed mould-free with the maximum recommended moisture content of 10%. Therefore, we do not advise this method. The solar dryer presented in the pictures is recommended but the polyethylene used should be uV treated or opaque (if the plastic is black, beware of temperature increases and be sure it does not go above 55°C). The air intake should be filtered to keep out dust. Organza or muslin cloth can be used as a filter. Spread the leaves thinly on mesh and dry in the dryer for about 4 hours (Temperature range is 35°C–55°C on a very sunny day). The final product should be very brittle. We recommend solar drying for both small and large scale processing, particularly for those in rural communities where there is no electricity. Loading density should not exceed 2 kg/m2. use electric or gas hot-air dryers. Drying temperatures should range between 50°C and 55°C. If temperature exceeds 55°C, leaves will "burn" and turn brown. Leaves should be dried until their moisture content is below 10%. We recom- mend this method for large scale leaf processing as this ensures year round production. Loading density should not exceed 2.5 kg/m2. Mill dry leaves using a stainless steel hammer mill. leaves can be pounded in a mortar, or milled with a kitchen blender. Small-scale processors can use a burr mill or rent a commercial hammer mill for routine milling of their products. Sieve the leaf powder if need be. When you mill with a hammer mill, the fineness of the product will depend on the size of the screen used in milling. If too coarse, sift using a sifter with the desired screen size. Moringa leaf powder can easily be contaminated by moulds as it strongly at- tracts moisture. In addition finely milled powder makes it easier for bacteria to penetrate the particles. All persons involved in the packaging of moringa leaf products must ensure that, while on duty, personal cleanliness and hygiene are maintained. Personal protective equip- ment (PPE) such as head caps, nose masks, disposable gloves, etc. must be used at all times. The temperature and humidity must be controlled in the packaging room, to avoid re- humidification of the product. After drying, the powder is left to cool and packed into clean, single-use polythene bags and sealed. This is enclosed in a second polythene bag and heat-sealed. This is to maintain freshness and dryness prior to further use. The bags should be stored in a cool, dry place. Moringa leaf products should be packaged in clean, dry and opaque containers made of materials that do not affect the quality of the product.Each package must be properly sealed to prevent content leakage as well as moisture absorption.